Professor Eric Morgan of the Institute for Global Food Security at Queen’s, has helped uncover the secret of a mass mortality event in Remote Steppe Grassland of Central Asia. The sudden death of 200,000 critically endangered saiga antelopes is believed to have been caused by unusual environmental conditions. As part of an interdisciplinary, international research team Professor Morgan helped investigate the sudden death of more than 80% of the affected population of saiga antelopes – which is more than 60% of the global population of the species – in Kazakhstan in May 2015. In just three weeks, tens of thousands of healthy animals died of haemorrhagic septicaemia across an area larger than the Brisitsh Isles, caused by Pasteurella multocida bacteria. The pathogen had most probably lived harmlessly in the saigas’ tonsils up to this point, so what caused this sudden dramatic die-off? New research by the international team – from Queen’s, the Royal Veterinary College, the Department of Zoology at Oxford University and researchers at universities in Sweden, Kazakhstan, Germany, Belgium and Italy – has shown that many separate (and independently harmless) factors contributed to this extraordinary phenomenon. In particular, climatic factors such as increased humidity and raised air temperatures in the days before the deaths apparently triggered opportunistic bacterial invasion of the blood stream, causing septicaemia (blood poisoning). By studying previous die-offs in saiga antelope populations, the researchers were able to uncover patterns and show that the probability of sudden die-offs increases when the weather is humid and warm in spring, as was the case in 2015. The research also shows that these very large mass mortalities, which have been observed in saiga antelopes before (including in 2015 and twice during the 1980s), are unprecedented in other large mammal species and tend to occur during calving. This species invests a lot in reproduction, so that it can persist in such an extreme continental environment where temperatures plummet to below minus 40 degrees Celsius in winter and rise to above 40 Celsius in the summer, with food scarce and wolves prowling. The saiga antelope bears the largest calves of any ungulate species relative to the mother’s size. This allows the calves to develop quickly and follow their mothers on their migrations, but also means that females are physiologically stressed during calving. While high levels of mortality are therefore to be expected, the species’ recent history suggests that die-offs are occurring more frequently, potentially making it more vulnerable to extinction. This includes losses of 60% of the unique, endemic Mongolian saiga sub-species in 2017 from a virus infection spilling over from livestock. Poaching since the 1990s have also been a major factor in depleting the species, while increasing levels of infrastructure development (from railways, roads and fences) threatens to fragment their habitat and interfere with their migrations. With all these threats, it is possible that another mass die-off from disease could reduce numbers to a level where recovery is no longer possible. This needs to be countered by an integrated approach to tackling the threats facing the saiga antelope, which is ongoing under the Convention on Migratory Species’ action plan for the species. Professor Morgan said: “These die-offs were devastating to the saiga antelope, and remind us of the need to support the conservation of large and healthy wildlife populations, able to survive such events. This research was conducted as part of a wide international collaboration, adopting a ‘One Health’ approach – looking at the wildlife, livestock, environmental and human impacts that have driven disease emergence in saiga populations. The ‘One Health’ approach reflects the values and ethos of The Institute for Global Food Security (IGFS), a Global Research Institute within Queen’s. Professor Morgan added: “Research at Queen’s is tackling the huge global issues of food security and the links between animal disease and the natural environment. This shocking outbreak showed that animals are vulnerable to devastating disease triggered by environmental change, and this could apply also to livestock. 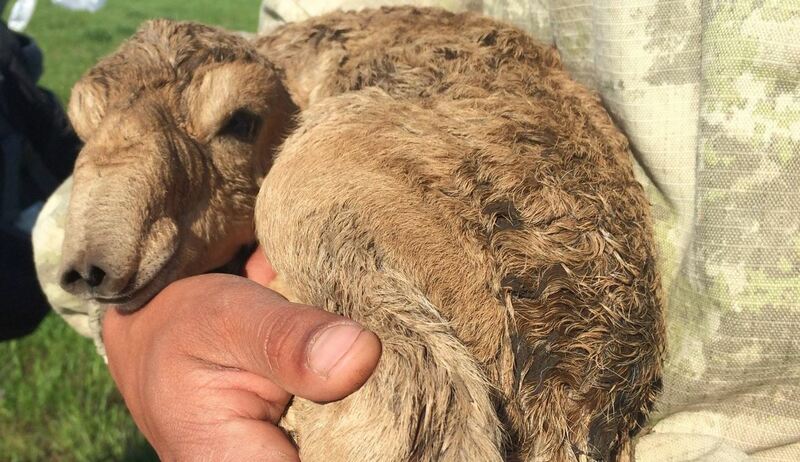 Adopting such a holistic approach has enabled the research team to understand the wider significance of die-offs in saiga populations, beyond simply the immediate causes of the 2015 epidemic. Media Enquiries to Sian Devlin Queen’s Communications Office, telephone: +44 (0)28 9097 5292. Photographs (above and headline) courtesy of the joint saiga helath monitoring team in Kazakhstan.